The Spaniard was absolutely brilliant with his precise finishing and his ability to outfox the rival's defense with his creative moves. 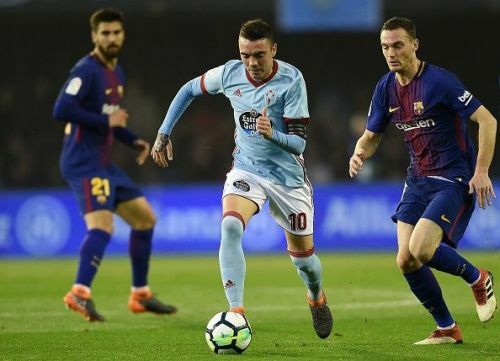 Though the 30-year-old’s performances were overshadowed by some big names in the La Liga, Celta Vigo manager Juan Carlos Unzue had stated that the biggest strength of Iago Aspas is the kind of intensity he brings on the field. He scored 22 goals in 34 games with 5 assists to his name. The 30-year-old has been quite good when it comes to his clever passes and his ability to make constant inroads in the opposition’s defense with his quickness. The striker has looked impressive during set pieces and has always looked to play his natural game which is to attack. His performance in a game against Sevilla in April was a treat to watch in which he scored 3 goals helping his side to win the match with a 4-0 scoreline. The former Sevilla player was a vital cog for Celta Vigo whenever they played against some of the bigger teams like Barcelona and Real Madrid. The striker outclassed the best defenses which earned him praise from Ernesto Valverde as well. 10 greatest players in La Liga history ranked - Do Messi and Ronaldo make the cut?